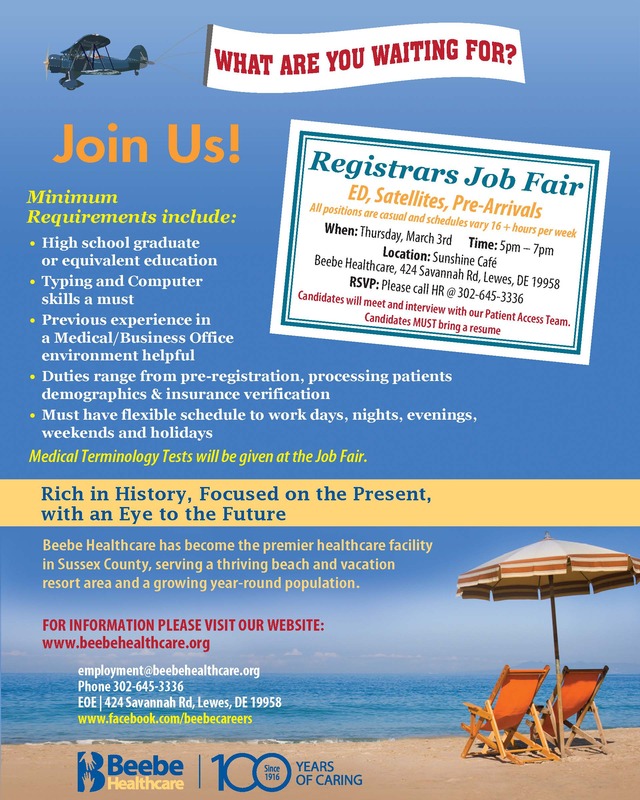 Beebe Healthcare is hiring casual registrars for its Emergency Department, Central Scheduling, and for satellite locations. Find out more about these exciting positions during a Job Fair on Thursday, March 3, 5 p.m. to 7 p.m., in the Sunshine Café at Beebe Healthcare’s Lewes campus. Candidates will meet and interview with our Patient Access Team. All the positions are casual and schedules will vary, but most will be 16 hours or more per week. All candidates must bring a resume to the job fair. • And, the ability to perform the duties of pre-registration, including processing patient demographics and insurance verification. Medical terminology tests will be given at the job fair. For more information and to RSVP, call Beebe Healthcare’s Human Resources Department at (302) 645-3336.